Laser cutting machines provide a wide range of opportunities and possibilities for designing and fabricating goods. 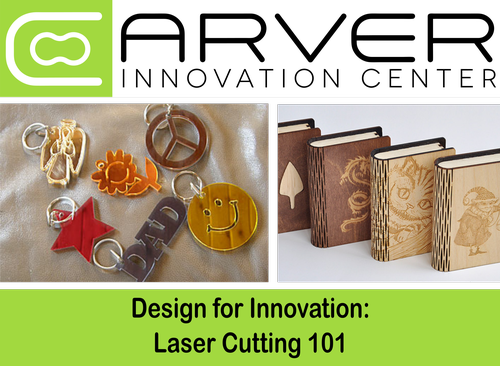 The versatility, speed, and precision of a laser cutter enables makers, hobbyists, and entrepreneurs to produce everything from simple machine concepts and prototypes to packaging to invitations and photo engraving. For more information, please contact us at (708) 697-6250 or use the "Send an Email" link to the right. The registration fee is $25. Registration closes 24 hours before the start of the scheduled workshop. This class is designed for a maximum of 15 participants.